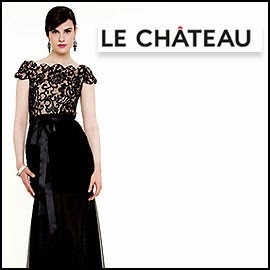 Le Chateau offers an elegant two-color dress that would make a classy impression at prom. The taupe-colored top portion is accented with black lace. It has cap sleeves and a scalloped boat neckline. You can't really tell from the photo whether the black skirt is somewhat shear. Ask when ordering. It's possible that a long black slip would make the dress an option for you.